Pears,Bartlett, picked your own, from the Niagara Peninsula today for 25 dollars. The pears in this picture are all “green,” even the two in the third quadrant, which got a “suntan” so it has a rosy spot.The pears are all hard. Fruit produces a natural ethylene gas, which causes it to ripen. The riper it gets, the more gas it gives off, which will cause the other fruit around it to ripen too.So to ripen pears, you should enclose them so this gas will be trapped around the fruit.I place a thick towel over the basket and put the bushel in a relatively cool place in the house.To tell if they are ripe, just gently press with a finger near the stem, on the pear’s “shoulder.” A ripe pear will give a little. Check daily since pears can over ripen quickly. 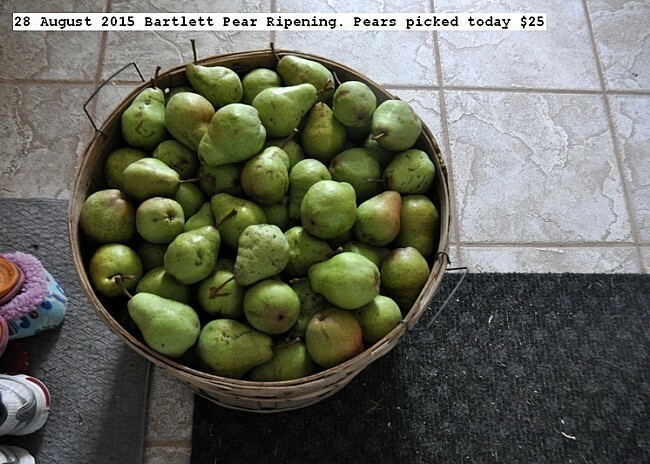 This entry was posted in Uncategorized and tagged 28 August 2015 Bartlett Pear Ripening, Bartlett Pear Ripening. Bookmark the permalink.